alaTest has collected and analyzed 56 reviews of Sony Handycam HDR-TG5V. The average rating for this product is 4.1/5, compared to an average rating of 4.0/5 for other Camcorders for all reviews. Opinions about the portability and image quality are on the whole positive. The size and design also get good feedback, whereas there are some mixed opinions about the zoom. The memory and price get critical reviews. We analyzed user and expert ratings, product age and more factors. Compared to other Camcorders the Sony Handycam HDR-TG5V is awarded an overall alaScore™ of 80/100 = Very good quality. 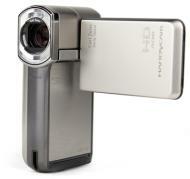 alaTest has collected and analyzed 43 user reviews of Sony Handycam HDR-TG5V from Amazon.com. The average user rating for this product is 4.0/5, compared to an average user rating of 3.9/5 for other Camcorders on Amazon.com. Reviewers really like the portability and size. The image quality and design also get good opinions. The memory and price get critical opinions, and there are some mixed reviews about the zoom. The HDR-TG5V is a bit overpriced for what you get—a mid-range camcorder with a high-end price tag. Now, it isn’t quite as expensive as most top-line models, but with an MSRP of $999, the HDR-TG5V is not for people on a budget. Why did Sony take away 5.1 Dolby Surround? Works Great With Mac OSX 10.6 No Issues Yet! Record brilliant, 1920 x 1080 high definition video on the go with the ultra-portable Sony HDR-TG5V Handycam camcorder, with a strong and lightweight pure titanium body and a built-in GPS receiver that maps where you shot your videos and photos and can display your current location, the HDR-TG5V makes an ideal travel companion.